is considered to be one of the holiest shrines in Hinduism. The cave is surrounded by snowy mountains. Hundreds of thousands of Hindu devotees make an annual pilgrimage to the Amarnath cave on challenging mountainous terrain. 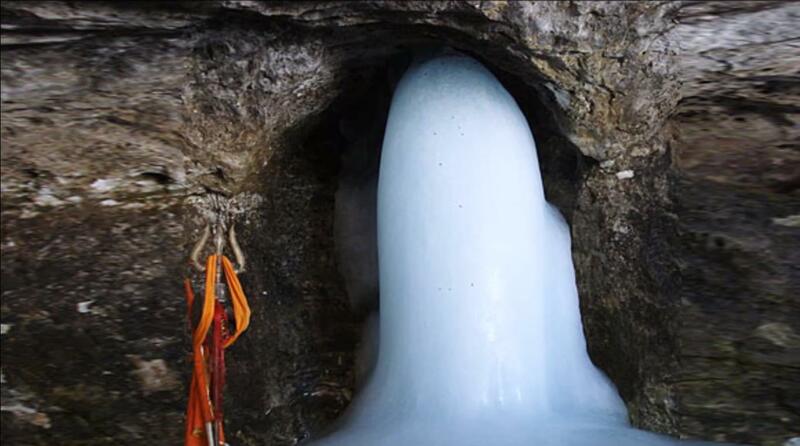 I want to know that what has been said in Hindu scriptures about Shiva linga of Amarnath. Mrityu tormented Devaas, headed by Indra, approached Parama Shiva for refuge and protection and appealed as follows to the ever merciful Shiva. Devadhideva! Do kindly show us a way out from the strangle hold of Mrityu so that it should not overcome us and torment us; kindly ensure that the desperation and constant threat to your Bhaktas like us be terminated forthwith. Bhagavan himself adjusted the Chandra Kala on his head and pulled out a flow of Sacred River named Amaravati from his body. The River materialised into chilled cool drops and as many drops of Amrita that flowed turned out to take the shape of a hallowed Linga decorated with Bhasma and that indeed was the Amara Natha Maha Deva Himself). This was how Maha Deva got melted from the desperate cries of Devas to save themselves from the clutches of Mrityu (That indeed was the Origin of Amara Naatha Linga!). Many articles listed here also have some information from scriptures or early texts on the Amarnath Linga. Not the answer you're looking for? Browse other questions tagged shiva temple shiva-lingam jyotirlinga .